If you have ever worked on finalizing a paper you’re familiar with a long list of little (and not-so-little) things to do (e.g. ‘convert Figure 2 to black-and-white’ or ‘cite a particular individual more extensively’). Instead, of keeping such lists in OmniFocus I use a great app called TaskPaper, ideal for managing simple but rapidly changing to-do lists for which OmniFocus feels too complex and slowly moving. TaskPaper is a text- and keyboard-based tool to quickly capture and organize tasks. It is great for managing items that need to be checked-off (often on the same day) but do not require thinking through, review and follow-up as in OmniFocus. To capture tasks in TaskPaper, press ⇧⌘↩ (or another shortcut you define in Preferences), which brings up a little window where one or several lines can be added and quickly assigned to any of the open files and projects. 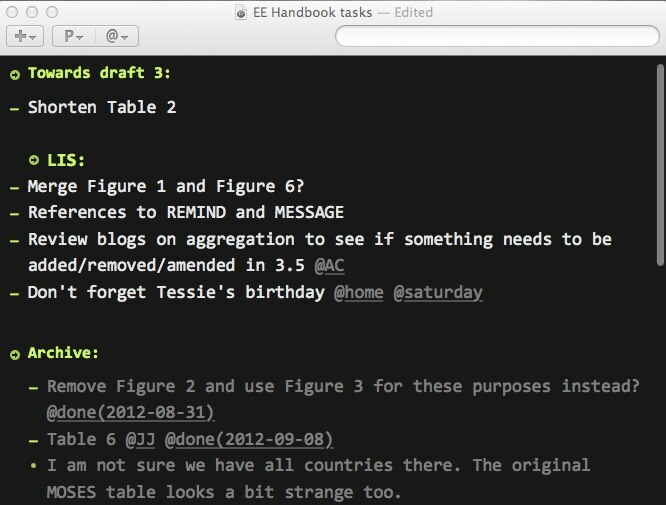 Within TaskPaper, any text line starting with a “–” is a task. Tasks are grouped under “projects” (any line that ends with a colon (“:“) is a project) and can be assigned to “contexts” (the text starting with “@” at the end of the line is a context). Clicking on a project or a context would filter the tasks that belong to that project or context. Clicking on the dash in front of any task or typing @done at the end of it would mark this task as complete. Completed tasks can be archived (moved to the end of the list) by pressing ⇧⌘D. There is no need to keep TaskPaper as organized as OmniFocus. It is to quickly throw things in and then check them off before any review is due. TaskPaper is great not only for finalizing manuscripts and reports. I usually keep three TaskPaper files open and ready for quick entry. One is called “Key Projects” with a few rapidly moving projects (manuscripts are a good example). Another one is called “Discussions” with the evolving list of items I want to discuss with colleagues (it is organized by the names of these colleagues). The final file is called ‘Running tasks’ and it is usually for keeping the list of things which are ‘coming at me’ and need to be finished on the same day. I sometimes use a sheet of paper and a nice pen instead of this last file. Well, at the end of the day TaskPaper is exactly that: an electronic sheet of paper to quickly jot things down, cross them out and move on. Det här inlägget är till Tessie som fyller år idag! This entry was posted in Tasks and tagged OmniFocus, TaskPaper. Bookmark the permalink. And of course, to keep your system unified, you can create a task in Omnifocus that you need to address the Taskpaper list, and then just drag the icon at the top of your TaskPaper list onto the Omnifocus task to create an easy link out to it. I say \”of course,\” but I hadn\’t thought before about how that might be useful for relegating to TaskPaper the functions it is, as you point out, somewhat better for. I like the idea of what you are doing, but being short on funds to buy TaskPaper, I am thinking of doing this in nvAlt. I saw this article (http://macsparky.com/blog/2013/6/nvalt-wiki) the other day that seems to also make an nvAlt based implementation. I like and have used Taskpaper for a while, but I have fallen in love with a similar online outliner called Workflowy (workflowy.com) which makes quick list making and organizing very easy, and it synchs to iOS as well. Have you tried it, and if so, how do you think it compares with Taskpaper? Thanks for the tip. I will try. I am now on TaskPaper 3 though and loving it.